Opposite the former Working Mens Club in what is now part of the JST Forklift yard alongside Foot Lane, there used to stand a large wooden hut on brick piers, know as the Village Institute (or the Stute). The Institute is on the left, looking down the Higham Road (B645) toward the Green. The land was purchased from the Northants County Council in 1925 for £10 and a wooden (ex-Army) hut was erected on the site in 1931. A brick chimney was installed halfway down one of the long sides (Foot Lane side). An article in the Rushden Echo and Argus indicates the costs were £325, of which £150 was paid on delivery and the remainder in instalments over the next 3 years. The hall had a small stage at the bottom end, with a dressing room off either side. In front of the stage was a dance floor. Dances were held on a Saturday night. The music was provided by Reg Sanders of Raunds, who called himself 'Sandersound'. 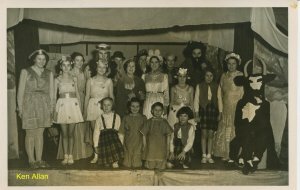 There were also film shows from time to time and the Court Estate players would put on some performances, as well as the school Christmas Nativity plays. During WW2, the Home Guard used it for drill nights on Mondays and Thursdays, as well as the villagers' ration coupons being issued by the Ministry of Food. 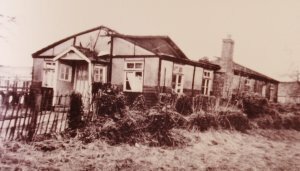 The Institute was used until heavy snows in March 1970 caused the roof to collapse. The cost of repairs was beyond the financial resources of the committee. Eventually the old School became the new Village Hall in 1972, with some of the old furnishings. The collapsed institute after the snow in March 1970, as seen from Foot Lane. The committee decided to sell the old site to raise funds to improve the new Village Hall, however, this uncovered a tangled web regarding who actually held title to the land, eventually resulting in the old institute being registered as a charity, in order that the sale could be authorised by the Charity Commission. Both the Working Mens Club and JST Forklifts made offers for the site, resulting in a private auction organised by Henry H Bletsoe & Son (surveyors and auctioneers) on 2nd June 1980, with JST Forklifts making the highest bid.